Intro to Pace Combinations | Mediterra - Swim & Run Better Than Ever! A question from a friend about Pace Combinations made me realize that I have referred to Pace or SPL x Tempo Combinations several times without really laying out a direct introduction to it. So this essay is meant to give a brief explanation for Pace Combinations and how we might use them. However, this an advanced topic and won’t mean much unless the swimmer has started to work with SPL and Tempo a bit, and has some experience for how those are constructed and how those affect (or are affected by) effort and speed. And this introduction will open the door for new ideas and questions, so I am not trying to answer everything in this essay. A Pace Combination is referring to the precise pair of SPL and Tempo that a swimmer will use to swim across the pool. This will mathematically produce a certain amount of time. The equation I used to make this chart is based on a 25 meter pool, with the swimmer making a consistent 5m push-off and 3 seconds for that push-off (we would adjust that number if we want to take into account the time of the flip turn also). Why do Pace Combinations matter? Think of the analogy – every time you ride your bike it is set to a certain gear (even on a fixed gear bike). You may not think about what gear you are in, and certainly you may not know the exact size of the cogs that are engaged but every stroke of the pedals is shoving the bike along with a SL x SR combination. You will think about the gear if suddenly you peddle into conditions that the current gear on the bike is not appropriate for – go down a steep hill and the gearing will feel too fast/light or go up a steep hill and the gearing will feel too slow/heavy. The same applies to running or walking. At any pace you have a distance you travel on each step and each step takes a certain amount of time. When you approach a hill or stairs unconsciously you will switch stride length x cadence to match the terrain and keep your heart rate from going too high. Well, when you are swimming it is the same also. Each stroke makes you travel a certain distance and it takes so many seconds to execute each stroke and travel that distance. Try to go faster and the water will push back against you harder – and so you adjust SPL and Tempo in reaction… unless you’ve intentionally trained your body to have a different response. Most people swimming in a pool may never think about this until someone starts talking about stroke length and tempo, but everyone experiences it. No matter what effort you put out, you are moving along at some SPL x Tempo combination, whether you think about it, plan it, or not. It is simply an external measurement of how one is using strokes to make progress. We use this measurement as a way to describe what we are currently doing to get across the pool, and then to consider if we might be able to do it better. It does not tell us everything we need to know, but it tells us a lot of useful things and can be used to guide our training in very effective ways. Once you start experimenting with SPL and Tempo in the pool you will quickly see that you can change your SPL, or that you can change your Tempo. Changing one or both will affect speed. And changing one will have an effect or urge an effect on the other variable too. When you are swimming near the limits of your conditioned range in either SPL or Tempo (at either extreme end), changing one of those variables will force you to change the other one inversely. A longer stroke urges a slow tempo, and a faster tempo urges a shorter stroke. Why? This is inertia at work in this physics situation – demanding you to react to maintain the current energy state. Which on is the best? Practicing further you begin to see that you might actually mix and match different SPL x Tempo combinations to get different effects on speed and on energy-expense. Then the questions arise. Which one might be better for me? 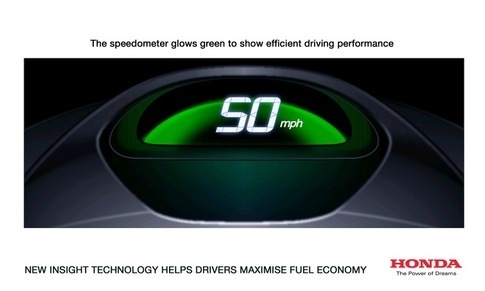 Theoretically, there should be a golden SPL x Tempo in that chart for every human being in any swimming event, which allows you to get some sort of ideal balance between speed and energy expense – like the Green Zone on your smart-cars dashboard which shows you the optimal speed to travel for fuel efficiency. For different distances and different terrain that smart-car may advise you to drive at a different speed, in a different gear to attain the best efficiency for that destination and terrain. We’re aiming toward making ‘smart-car’ pilots out of our TI athletes, who train specifically to improve sensitivity to an internal Green Zone performance level for their chosen event. (This is a necessary skill for serious triathletes, for sure, since they need to save as much energy as they can for the more win-critical parts of the race ahead). 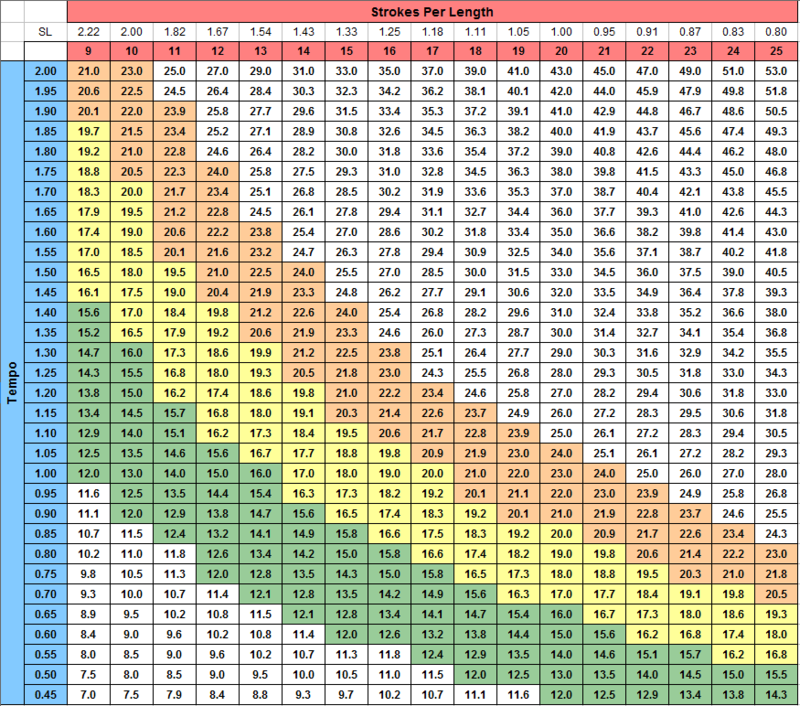 So, this chart allows you to quickly look up your combination options to create any pace. It does not tell you which one will be most efficient for you. But combine it with the Height/SPL Index (viewed on our Resources page) and you have a reliable guide to point you in the right direction. (I will talk more about Efficiency in the following essay). Based on statistical view of modern swimming we see that the most successful swimmers tend to use a stoke length (SPL) within 55% to 70% of their height (or wingspan). (No one cannot prove it, but we can feel some confidence in assuming this SPL range will be most efficient for human freestyle swimmers). Going back to the Pace Combination chart, look up your SPL range in the columns, then scroll down to find the time (per 25 meters) that attracts you. Then scroll over to the left to see what Tempo you must use with that SPL to achieve that Pace. It is easy to look up on the chart and pick one combo. But you must now train to achieve that combination and this is where you need to get some input on an effective training method. Once you start training for it, you’ll see how challenging it is to hold both (hence, the reason for the previous essay Stroke Length Loyalty). Of course, in your current condition you may only be able to use tempos in a certain limited range. This doesn’t mean you can’t use the faster ones. This just means that you are currently conditioned for the slower tempos you swim now, and you are not conditioned for the faster one you need to use to reach your pace goal. You can train to extend your comfortable tempo range so that you have the option of more SPL x Tempo combinations for a variety of swimming distances and conditions. (We cover this skill in Step 3 of our online Self-Coaching Program). He didn’t know he had these options before. Now the question arises in his mind: Which one is better? Which one will feel easier to me? Which one should I use when swimming a certain race? Or which should I use at different parts of the race? One motivation for experimentation is to discover how these different combinations feel in your body. As you improve your SPL control and expand your Tempo range (becoming comfortable with both faster and slower tempos) more combination options will open up for you and you will be in a better position to decide which gives you speed for less energy expense. Then, when you have a specific race in mind and have a pace you want to achieve for it, you can look up your pace combination options and decide which one (or which array of them, for more sophisticated race strategy) you want to use in your race to maintain pace and begin training to imprint those specific combinations into your neuro-muscular control system. I am going to stop there. Undoubtedly, this will and should raise more questions. I cannot anticipate them all or take up more space to address the ones I can already hear from you in my head. I will await comments and emails to let me know what else I can offer an explanation for.